My white fruit of choice is banana ! I love bananas, all types. Growing up in New York as a kid allowed me to experience so many good eats! New York is well known as a melting pot. There are people from all over the world residing together in New York. The best part about this is that they just don’t bring themselves, but they bring their cultures. We all know that food is a huge part of any culture! I have always enjoyed Puerto Rican, Cuban, Dominican, and Caribbean dishes. One thing these all have in common are Plantains or Plátanos . At first, I waited until visiting to eat some and now that they are available at my local grocery I can buy and cook myself! Wikipedia says, a cooking plantain or plantain is a fruit of one of the cultivated varieties of the genus Musa intended to be consumed only after cooking or other processing, rather than being eaten raw. 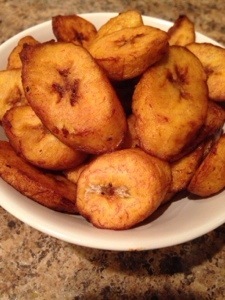 I usually fry my plantains, but they can also be baked and boiled. Green or “unripe” plátanos are starchy vegetables. They can be used in soups, stews, boiled and mashed. Most Puerto Rican recipes that use plátanos call for green plátanos and need to be VERY green without a hint of yellow. The next stage of ripeness is when the skin is mostly yellow with a few black speckles; these are the ones I pick. In this stage of ripeness, the plátanos has lost some of its starch and is slightly sweet. I use coconut oil to add to the sweetness! Most countries prepare plantains as a side dish as do I. Last night I cooked plantains as a side to my tofu curry and basmati rice. It was delicious. 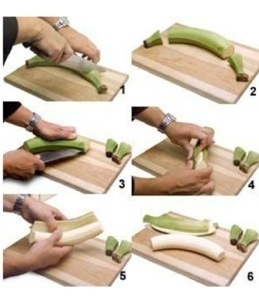 To fry them just peel, slice, and fry. Previous Post Top 6 White Fruits & Veggies !